It's not an exaggeration to say that Scott Boras is the most recognizable and polarizing players' agent in the history of sports. In fact, if you asked people to name all of the sports agents they can off the top of their heads, I'd bet that the majority of people could only name Boras. Even if you read a list of other prominent agents to people, few would know who any of them even were. Four of these people are listed among the 17 "Notable sports agents" (other than Boras) from the three major U.S. sports on Wikipedia. The other four are names I completely made up. See? It's true that Boras represents some of the games biggest stars - names like Alex Rodriguez, Manny Ramirez, Mark Teixeira and Prince Fielder. But do Scott Boras clients really get paid more than they should, or does it just seem that way because of his impressive list of clientele? This group of players earned a combined salary of $76.6 million in 2009. Of that, $35.6 million, or 47%, was paid to Scott Boras clients. 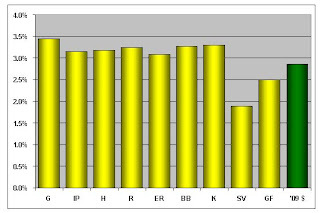 Yet, among this group, the Boras clients hit only 37% (124 of 338) of the home runs. You could conclude from this example that Scott Boras clients are overpaid as compared to their production. However this is a very small sample and includes Mark Reynolds who could be throwing the numbers off. What if you did this same thing though for baseball as a whole? The USA Today Baseball Salaries Database lists the 2009 salaries for every player who was on a Major League roster on opening day. I (painstakingly) matched up every players' 2009 salary to his 2009 statistics. Scott Boras' Wikipedia entry contains a list of his clients. I flagged every Boras client in my database. A total of 401 hitters and 380 pitchers are included. I find that staggering. Among Major League hitters, Scott Boras clients earned 15% of all salaries paid in 2009, yet accounted for only about 9% of all offensive production. Not only are Scott Boras clients overpaid compared to what they produce, they are grossly overpaid. As a group, hitters represented by Scott Boras earned about 70% more money than they should given the sum of their offensive contributions. 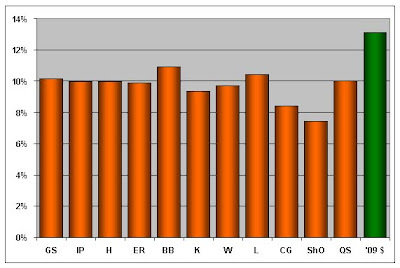 Again, starting pitchers represented by Boras are overpaid for their production. 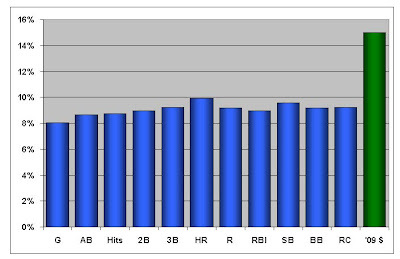 The difference is not as severe as for hitters but it still clearly exists. In my database, 15 of the 153 starting pitchers are represented by Boras. ...except for saves - the money stat. The two most prominent relievers that Boras represents and Mike Gonzalez and Scott Schoeneweis. Hardly a who's-who of bullpens. The topic of Scott Boras is of obvious interest to Brewers fans as they wrestle with the next big item on their agenda - whether they should and are able to sign Prince Fielder to a long-term contract. I've got much more data on this topic and many more charts to present. I just need to put them together into a cohesive article. I'll do that. Stay tuned. p.s. Pelinka (basketball), Genske (baseball), Fletcher (football) and McKinnis (baseball) are the real agents from my quiz above. Great post. Owners caved fairly easily to his demands in better economic times. It's fun to see him really have to work to save face after struggling to crank out a multi-year deal for Johnny Damon.